I’m a bit addicted to salted caramel right now. Remember these Salted Caramel Truffles? Yeah, they pretty much started this whole thing. With all the varieties I’ve already made, my mind was stumbling on what version next? And then it occurred to me…salted caramel. Let me tell you a few tricks to this recipe. It’s not easy and it’s not hard. It’s one of those, “read the directions before you begin” type of recipes. But I’m going to highlight a few things. Plan making this cake a day in advance. I made the cheesecake one night, then the next morning I baked the cake layers. In the afternoon I whipped up the frosting and assembled the cake. I then refrigerated the cake and made the ganache the following morning. We enjoyed the cake that afternoon. You can make the cheesecake layer further in advance by wrapping tightly and storing in the freezer until ready to use. I used my favorite dark chocolate cake recipe from scratch. But if you want, feel free to use a chocolate cake mix. I’ll never know! Refrigerate the cake once it’s frosted. The cold frosting stands up to the warm ganache. Speaking of ganache, allow it too cool slightly. Otherwise it would be a disaster. Drizzle with a homemade caramel sauce or use store bought. You decide! Slice yourself the first piece, because this cake will go fast, and you earned it! I hope the directions don’t scare you! This cake is worth every single second of preparation. If you’re going to enjoy something so sinfully delicious, you might as well work for it. And if you’re going to work for it, it better be sinfully delicious. 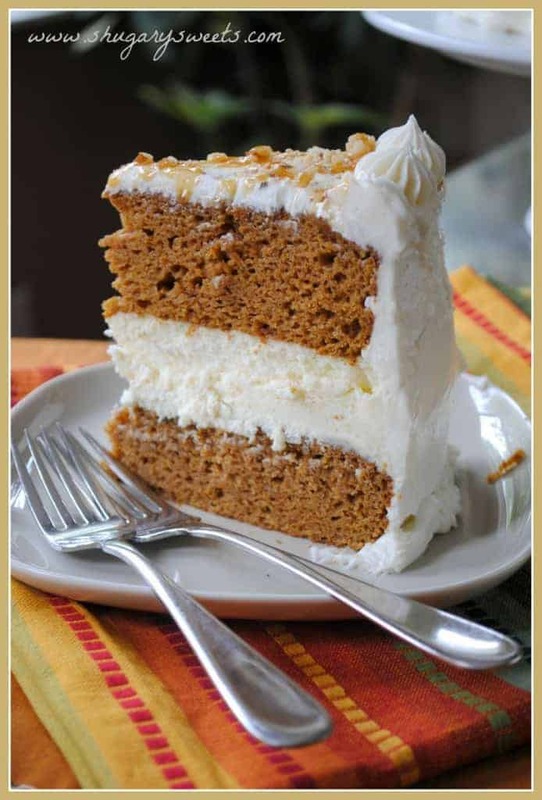 Pumpkin Cheesecake Cake: an impressive fall dessert recipe, topped with a cream cheese frosting! 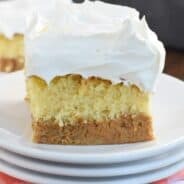 Eggnog Cheesecake cake: a homemade spice cake with an eggnog cheesecake and eggnog flavored frosting! 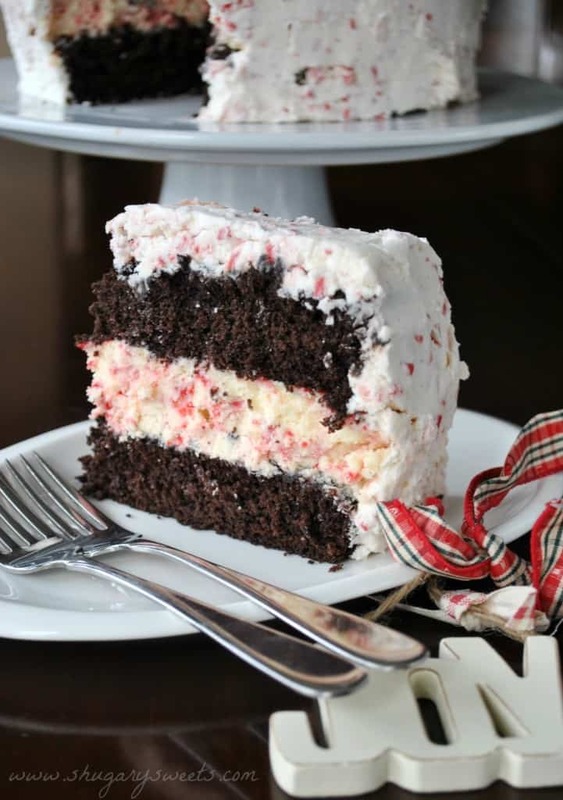 Chocolate Peppermint Cheesecake Cake: a holiday dessert that will make YOU the star! 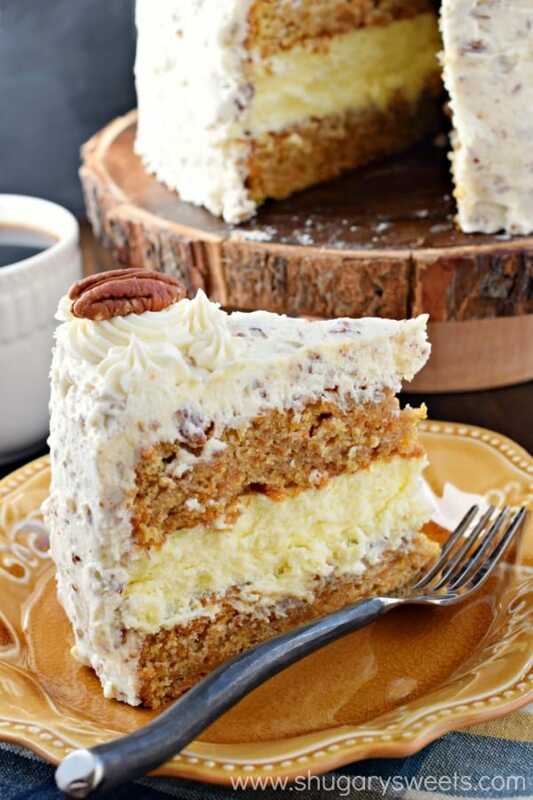 Carrot Cake Cheesecake Cake recipe: two layers of moist carrot cake, a middle layer of creamy cheesecake, all covered in cream cheese frosting with pecans! 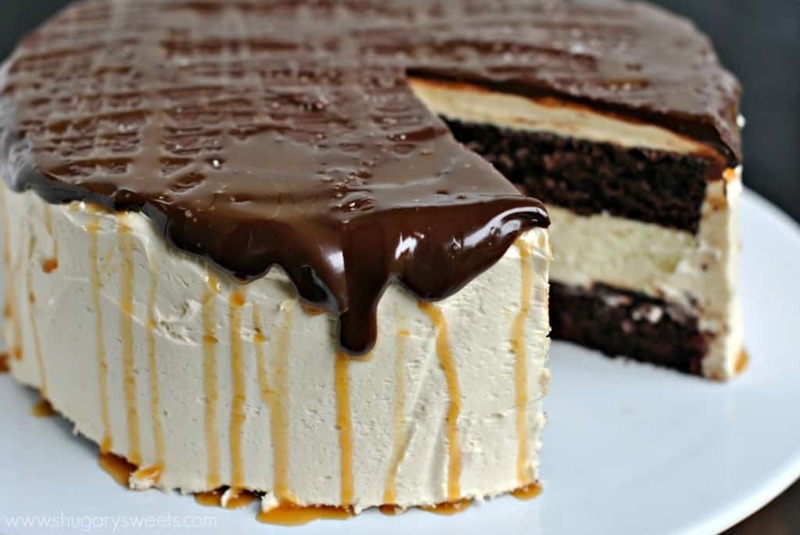 Salted Caramel Cheesecake Cake: delicious chocolate layered cake with a cheesecake center! Frosted with creamy salted caramel buttercream and chocolate ganache! 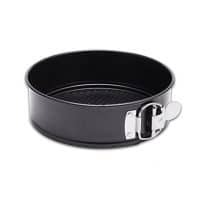 When cooled, transfer entire springform pan into the freezer for several hours or overnight. I put it in freezer for about 2 hours. **If using within 24 hours, feel free to just refrigerate cheesecake! 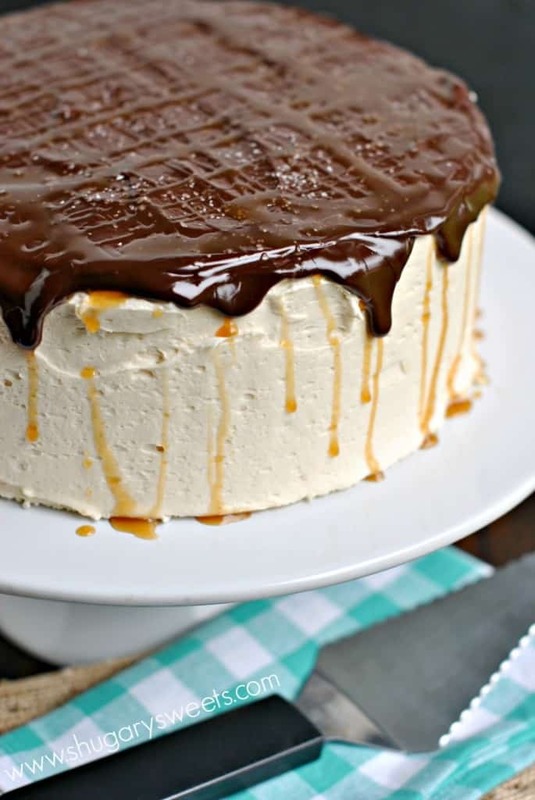 Today’s recipe for Salted Caramel Cheesecake Cake was first published on Shugary Sweets on September 21, 2014 and has been republished in August 2018. I don’t think I’ve ever seen a more gorgeous cake Aimee! Your slice is just perfection! Ganache is my very favorite way to finish off cakes and cupcakes – so decadent! I’m totally not surprise at how well your pumpkin cheesecake cake is doing on Pinterest – I drool every time I see it 🙂 Pinned! 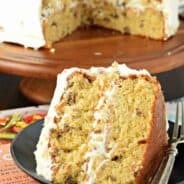 When I saw this, I instantly thought of your eggnog cake and your pumpkin one! Love this version! So eyecatching, and totally fat-free, right! 🙂 pinned! Totally fat free…assuming you don’t take a single bite 🙂 Thanks for pinning!! Oooooh. I’m in love with this Aimee!! Dying. Oh my goodness! All those layers… And those drizzles… And so much chocolate… I’m in heaven right now looking at your photos! I just might skip dinner and go straight for dessert instead. 😉 Pinned! Aww! 🙂 Right back at you lovely!! Total stunner! Love everything about this cake, Aimee! Pinned! Your feeding my salted caramel addiction again — I love it! This cake is gorgeous! Thank you Marcie! Sometimes those addictions need to be fed…wait. What? Oh my gosh – all those chocolate and caramel drips. Killing me. Looks delicious! And worth every bite! You are a cheesecake cake queen! This one is absolutely mouthwatering! Pinning! Well! It’s good be queen! Thanks for pinning. This cheesecake is gorgeous! Lovely recipe! This is worth every second of effort! It’s amazing! And it’s not crazy hard, either. You’ve just gotta plan ahead. I’m very happy with your salted caramel addiction. Keep going, please! I wish I could reach through my computer. This looks unbelievably delicious and decadent. This cake is full of all of my favorites. And the salted caramel just takes it over the top to perfection! It will definitely be making an appearance on my table soon! Pinned. Ok, so I have been totally dying over this cake since you text me that first picture. Why do you live so far from me? I want to come raid your kitchen daily you know…maybe it’s a good thing you are not closer. LOL! So, yeah, I just love everything about this cake. The salted caramel, the cheesecake, the chocolate!!! This cheesecake is a masterpiece. Not only the flavors are just perfect, it looks perfect! for real! Thank you Melissa!! I’m totally craving it again!! What a beautiful cake! The flavors, the look… totally worth every ounce of effort! Yes. I would have to agree. Then again if I disagreed that would be weird, hehe!! Wow! This is so decadent! Cheesecake and cake and ganache ALL IN ONE? You are a dessert whisperer. Pinned! Haha the dessert whisperer. That’s a new one 🙂 Thanks for pinning Taylor! I will be sure to serve myself the fist piece of this incredible cake and save myself the last piece too! Love everything about this cake! 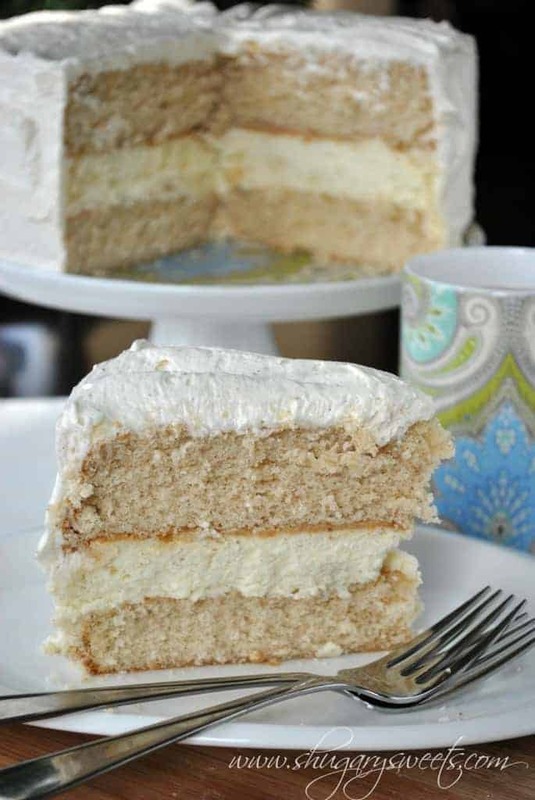 So many great layers and flavors wrapped up in one cake! I think that sounds like a fabulous plan!! What a gorgeous cake! It looks perfect and so incredibly yummy!!!! For my birthday?! You’re so sweet! Best cake ever! I love any recipe that uses the word “cake” twice. 😀 And all the salted caramel goodness! Look at that gorgeous chocolate that is inprisoning the cake. Plus their is cake and cheesecake and salted caramel. Yep, looks like I need a slice of that! This is one purdy cake. I love the cheesecake center. Nom! Wow! It looks like a labor of love but definitely well worth the effort! One question though?newbie in baking here,i was just wondering how can i layer the cheesecake w/o ruining it? And is it ok if i cant bake my cheesecake without using baine marie?ive only got a small oven.thanks for answering. You can definitely do this without the water bath, since that’s what prevents cracking in your cheesecake (and your cheesecake will be layered in the cake so it doesn’t matter much). As for the layers, just gently stack them on top of each other. ENJOY. Could you please tell me what kind of dark chocolate you use in the ganache? And is it sweetened or unsweetened? Thanks. I used Baker’s chocolate semi sweet. Found at any supermarket or bulk foods store. If you freeze the cheesecake, do you need to let it defrost at all before layering? If not, what kind of timeframe do you recommend for assembling it with frozen cheesecake before you serve it? It’s easier to assemble when the cheesecake is semi-frozen. I froze the cakes, but I wouldn’t recommend it because I found that the cake/cheesecake didn’t bond together and when serving it fell apart a little. I would warm the cakes after assembly but before frosting so that doesn’t happen. Just a thought. Just wanted to say this recipe was amazing but I chose to halve it because it’s just too much for one dessert. Took longer but fantastic! Loved it. Will definitely make it again. This is the best thing I’ve seen all night and I’ve been browsing Pinterest for what seems like forever! I am absolutely making this next week!! Just have a question :). How exactly are you putting the cheesecake onto the cake? What method works best? I am in the process of making this right now! The chocolate cake is made, the cheesecake is finishing in the oven. I am going to assemble tomorrow, but I have a question. Did you cut one chocolate cake horizontally for the layers or is it two separate 9 in chocolate cakes? Thank you for the help on clarifying this for me! Two separate 9in cakes. The batter for the chocolate cake she cited makes two 1″ cakes. I made them today too! They rose perfectly, although I did have to bake them an extra 3-5 minutes but that could be my fault for Being nosy and opening the oven to check on them. Thank you for including a link to my recipe for Margarita Cheesecake Cake, Amy! I have missed you and your blog and am so happy to be back blogging again. Wishing you and your family all this best this holiday season and for a happy, healthy and prosperous New Year! do you have a gluten free version of this? What did I do wrong if my cheesecake shrank after cooking? How long to do I need to cook the gauche if I make it on stove top not microwave? I hate using my microwave for melting chocolate. I am planning on making this for a special dinner dessert! What would have made my icing runny? Putting it on a warm cake, or not using enough powdered sugar, or too much liquid. You can always add more powdered sugar to thicken it up. Good luck! should the ganache be thick or thin? It’s a pretty thick ganache. hi! sorry im also a newbie to baking, am i suppose to cut the chocolate cake in half so i can layer it? Oh my, I made this for Fathers Day/ birthdays ( both of my boys were born on fathers day 3 yrs apart).Im not sure how I came across this recipe, I think I found it on Pinterest. I think this was one of the best cakes I have made. I wasn’t to sure about it at first, but I made it in stages, I made the cheesecake and caramel on Fri. evening, and then made the rest on Sat evening and served it on Sun. It turned out perfect, it was so good! And everyone loved it. Also I wasn’t to sure about the coffee in the choc cake, I really don’t like coffee and didn’t have any. I had to go to Starbucks and buy a cup of coffee, the cake didn’t have a coffee taste. I made the cake and the cheesecake one day and froze them both. (Also made the frosting but just refrigerated that.) The next day I assembled those three components and put it in the freezer until the next day. A little bit before we ate it, I made the ganache and put it on along with the caramel sauce and then stuck it back in the freezer for just a little bit. I was kinda going for the ice-cream cake feel. Thank you so much for stopping by and letting me know!! Love hearing the process for myself, and my readers. So glad you enjoyed the treat…and Happy Birthday!! I keep finding your blog via friends on FB and pinterest. I have to say I love your cheesecake cakes and have made all of them so far. Though I have to make mine gluten-free and corn-free so sometimes things are adjusted, but thank you for the inspiration! You are so very welcome. I’m so glad you have enjoyed the recipes! If you ever have the time, I’d love for you to comment and let my readers know any tips/tricks on substitutions for gluten free. That’s not an area that I am comfortable with, however many of my readers ask!! This cake looks so delicious! I was curious how the layers stuck together while slicing and serving.One of the comments stated that the cake should not be frozen. Sometimes I like to assemble and freeze for convenience. Should I add frosting between layers? Any recommendations would be appreciated. 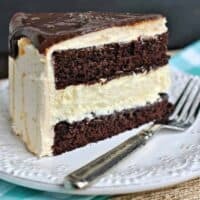 The beauty (besides the taste) in the layered combination is what makes this recipe so unique. You can definitely freeze the layers separately. When you assemble just stack them up. I don’t put anything between the layers (as it’s decadent enough with out)! ENJOY. I made the chocolate on today. There are no words to express how good this cake is to eat. I altered it to be gluten free for my family. I will be making this again and again. …and if you work for it you’ve used extra calories so it makes this cake well within the guidelines. I made this cake for my friend’s wedding in the winter and keep looking for excuses to make it again ever since. Pretty sure this in the best thing I’ve ever tasted, and it’s ALWAYS a hit no matter where I bring it! It doesn’t get any better than chocolate cake, cheesecake, salted caramel and ganache! I can’t wait to try this! My son’s birthday was today and he asked if he could google a recipe for his cake. I’m not sure how he found it. He printed it out and I was overwhelmed. It took me three days to make it all (partly because I was also making dinner for 25). I was worried it wouldn’t be worth all the effort. However, it was a hit with everyone…especially me! I put it on Facebook when I wished him a happy day. I can’t tell you how many people have stopped me or sent messages to me about wanting the recipe. Thanks so much for sharing it. I’m sure I’ll be making it many more times in the future. I made this one for my wife for her Birthday. It is a stunning cake! We had a dinner for her at Bonefish Grill and the staff there were in awe. (I did share a couple of slices with our and one other waiter) I also used your Dark Chocolate Cake recipe. It really did make a beautiful slice. She loved it, by the way, and I’m sure this will be the first of many appearances for this cake. Just wondering if the cream Cheese amount is correct ? 80 ounces seems a lot = around 8 cups ?? Opps, have read its again its 8 ounces. Sorry for my stupid question. Is the temperature in Celsius? I am in Australia and making the chocolate cakes as I type this now ???? 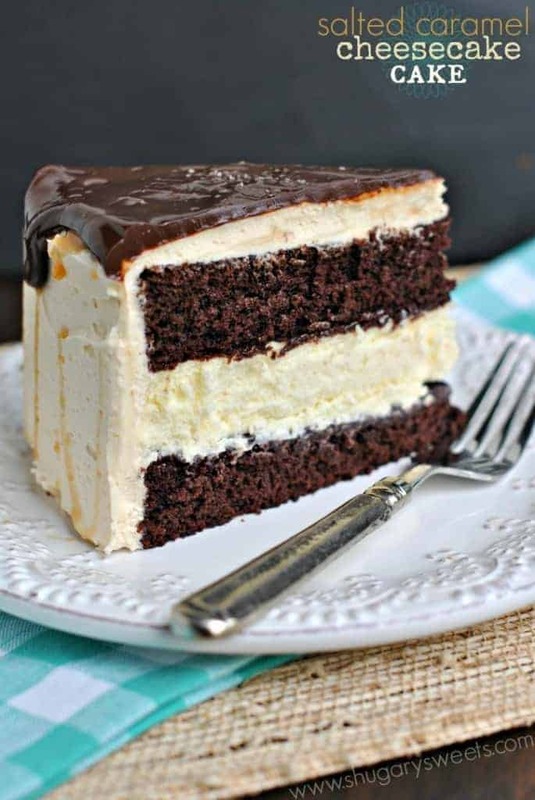 This is absolutely magnificent, scrumptious, delicious, super yummy salted caramel chocolate cheesecake cake. Can i post it on my blog? Tried this for my brother’s BDay, enjoyed by all. This is a dense, very sweet and filing dessert that is so delicious. 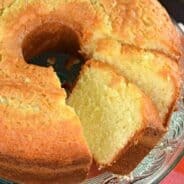 For those that are new to cake making, follow the steps and make it over 2 days and it comes out perfect. Very Yummy!! thank you for the recipe. I’ve made this cake and the pumpkin as well. They are absolutely delicious and the cheese cake layers came out so perfect! I have a question thatI was hoping you could help me with. I am wanting to make a cheesecake for my daughter‘s birthday but I would like it to be full thickness. Do you think I could I double the cheesecake portion of this recipe? How long should I cook it for? Thank you for your amazing recipes! I’m hoping to do this with brownie layers instead of cake. I’m a little nervous about the stacking step. Does the frozen cheesecake move well from one pan to the other? Or do I need to put the cake/brownie layer on top and flip? The cheesecake when frozen moves easily. 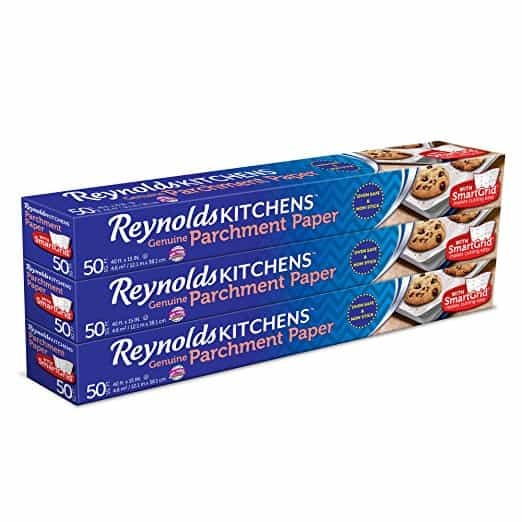 Just make sure you line your springform pan with parchment paper so that you can lift it out of the pan easily. Let me know how it turns out! This turned out amazing! Stacking the cheesecake was easier than I thought it would be. I used brownies instead of cake, but otherwise followed the recipe. Everyone loved it, with comments like “It was heavenly!” and “It was to die for!”. I definitely plan to make this again. Have you developed a recipe for a Strawberry Cheesecake Cake yet. I couldn’t find one on your site. 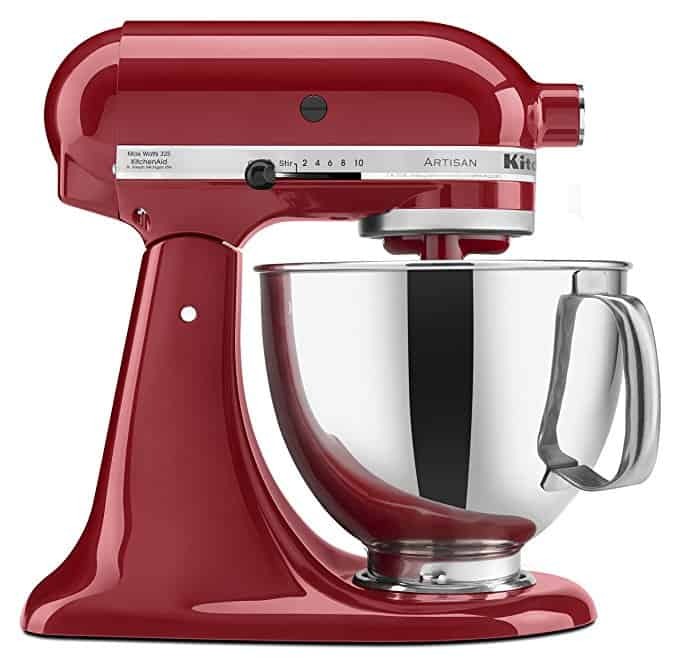 My grand daughter wants one for her birthday towards the end of the month and all your cheesecake cakes are delicious. I hope to find a great one in time to make her cake. Thank you for all the wonderful recipes. 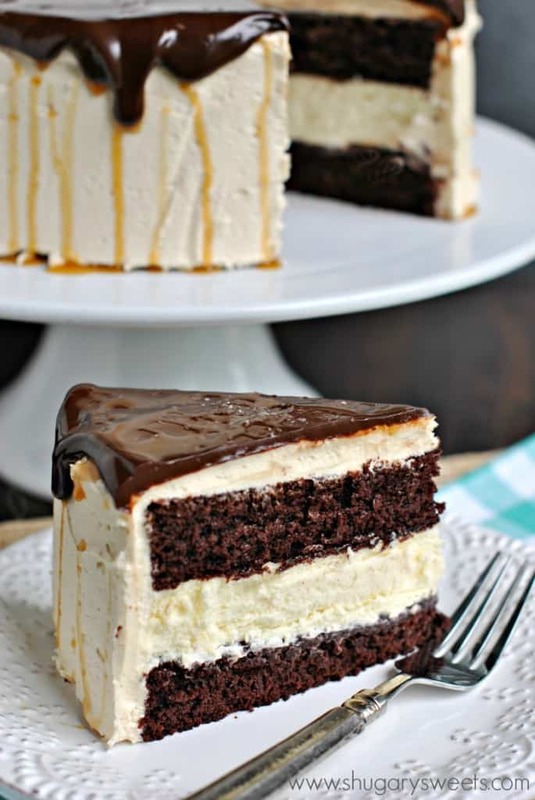 This salted caramel chocolate cheesecake cake just looks SO incredibly delicious and I am so craving a slice right now!